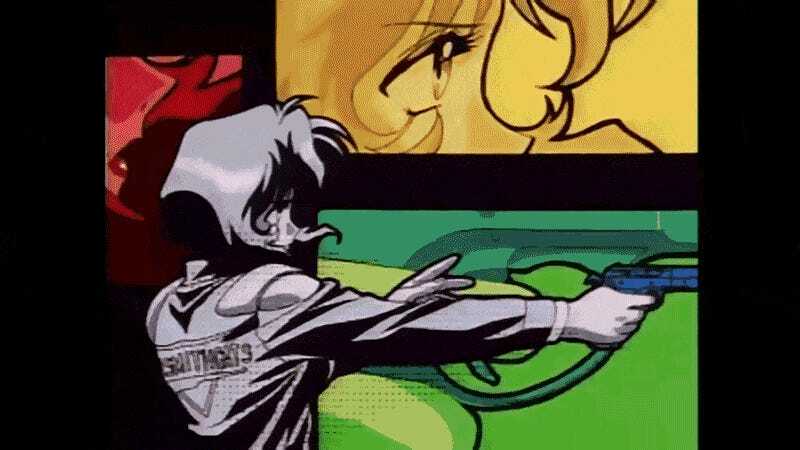 Gunsmith Cats follows Rally Vincent, a part time bounty hunter and gun shop owner, and her partner, explosives expert Minnie Hopkins. Bill Collins anA.T.F (Alcohol Tobacco and Firearms) investigator coerces them into helping himwith his investigation of illegal firearms trafficking. But things won’t be easyfor our girls, as they have they have to confront bullets, knives, corruptpoliticians, and a crazy Russian hit man. Guns, cars, babes and bombs! That’swhat this anime is all about! Tune in for some old school anime action in thisthree episode OVA: Gunsmith Cats! I absolutely LOVE this opening; the animation is cool and sleek with unique visuals. It also has some great Jazz to accompany it, very similar to “Lupin the Third” as well as” Cowboy Bebop”. I also have to comment on just how similar this opening is to Bebop’s. The multi-color windows, the silhouettes, it’s all very reminiscent of Bebop just without all the Sci-Fi elements. Of course this anime came out before Bebop so I’d say it’s influence came from Lupin (Which is a great series). Also the Jazz track in question is very good, it doesn’t sound as big bandish as Tank! And has an electric Jazz guitar in there for good measure. My only problem with the track is that it kind of sounds like it could be the opening of a 90’s sitcom (Oh god, does anybody here remember the original theme of Seinfeld?) but at the same time it has a sort of nostalgic sound that I find charming. The same can be said of the ED which, while it doesn’t have any unique visuals to go along with it’s music, is pretty solid. The soundtrack on the other hand consists of synthesizers and drum machines, pretty standard fare for the era. I grew up in the transitional era of animation; most of the cartoons of my early childhood were animated with cels. However as digital animation became more prevalent, due to how much faster and practical it is, it quickly replaced the old cel animation. While I’m not going to pretend that cel animation is technically better, I do believe that cel animation has a certain charm that just cannot be replicated digitally. I first found out about Gunsmith Cats when my brother in law bought the first episode on VHS at a thrift store. As we were watching it he commented on how he doesn’t like anime nowadays. He said that what he liked about anime was the gritty, grimy look of the 80’s and 90’s. Anime simply does NOT look like that anymore; now don’t get me wrong, animation today looks better than ever. The colors are vibrant, the image is sharp and the consistency in the fluidity of the animation has gone up. But even so, I can’t help but love the gritty, grimy look of old school anime, this one especially. While I don’t think the animation is as good as Bebop’s, it’s, at the very least, consistent, smooth and well done. It has that look that I just love and holds up a lot better than most of the anime of the time. The car chase scene in particular stands out as it reminds me a bit of the Laserdisc Anime Game “Road Avenger”. The car Rally uses, a Shelby Cobra GT-500, looks great and is animated beautifully, it really stands out and makes me wish there were more car chases. The action itself is well directed with plenty of explosions and lots of gunplay as well as a bit of fan service thrown into the mix. English Dubs back in the days were really hit and miss. Most Dubbed anime was shown on TV with a very localized script (Hey Ash, Check out these jelly filled donuts!) and heavy censoring. This not the case here, I watched both the Japanese Dub and the English Dub. Both are fantastic, but I think the English Dub is overall better. The script is well written and doesn’t deviate too much from the original script (At least from what I read of the subtitles). The Dub was made by ADV, most old school anime fans know about this studio (They also made the infamous English Dub of “Ghost Stories”) and the cast they chose is very solid. My favorites being Rally Vincent (Voiced by Amanda Winn Lee, voice of Rei from “Neon Genesis Evangelion”) who gives a charming performance as the gun slinging bounty hunter, and Bill Collins (Voiced by Rob Mungle who also voiced the hilarious cat in “Ghost Stories”) gives a great performance as the sarcastic ATF officer and has good chemistry with Rally’s VA. The supporting cast is solid and very consistent. The voice work really does benefit from the script, as it is very well written with plenty of fun dialogue to grab your attention. I must also mention the sound design; all the guns you hear in the show are supposedly recorded with the real thing, as well as the cars. While I’m no expert in guns or cars, I can confirm that the sound effects really pack a punch and you can tell that a lot of care went into them. What? WHY?!!! Well it’s to be expected, ADV went bankrupt a few years back and, unfortunately, no one has picked up the license. So if you want to watch it legally you have three formats to choose from: VHS, Laserdisc and DVD. Unfortunately all three formats are out of print and relatively expensive, the DVD copy goes for a hundred dollars new. It really is a shame too, as not a lot of people have heard of this show, it’s definitely what I would call a “Hidden Gem” and it’s only becoming more and more hidden. Of course there are other ways of watching this show; however it’s less than legal. All right guys, I’ll admit it: this show won’t win any awards for it’s immaculate writing, deep insight into philosophical ideas or tear jerking romance. It’s a fun old school action comedy with some decent writing and animation. So don’t expect anything more or anything less. It’s a popcorn flick, but a well-executed one at that, and I believe that deserves praise. I recommend this to any old school anime fan as I think they will enjoy it.